Midtown east is mostly filled with boring banks and offices, that is until you make your way to 211 E 43rd street. First glance is just another office building (they now have a sign out, when it first started there was no sign which made it “secretive”), pass the security guard, down the stairs and a little piece of Japan reveals to you. Feels like a restaurant in some little town outside of Tokyo. AT NIGHT, they offer sake lovers an impressive variety of sakes, with japanese style small dishes, everything from sashimi, beef tongue, rice balls, soba to self grilled steak on rock (one of my favorites, tender and juicy), and a unique dessert selection. Even if you don’t drink sake, this is a great place for after dinner desserts (ask about the dessert sampling). Good for dates *wink*. FOR LUNCH, you get a great value with their lunch specials, or set lunches. Homemade soba (hot and cold) paired with different grilled fish, sashimi, chicken. My favorite special is Thursday’s Bara Chirashi Don a cold or hot soba noodle with a bowl of chirashi(bits of salmon, squid, tuna sashimi, with eel, egg and dried squash over sushi rice). The soba noodles taste freshly made, might not be as good as Soba Nippons, but good enough for lunch. 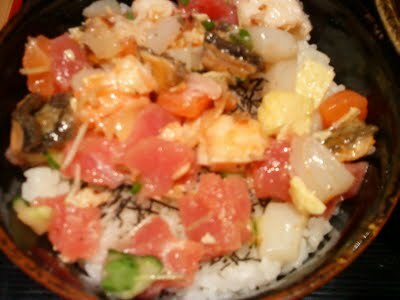 The sushi rice is cooked to perfection with just the right amount of acid, and all the toppings are super fresh, come flavored, so wasabi is optional. All for just $11.50. Most other days, I get the “Jewel” Oke Bento, which comes with assorted appetizers, fried veggie tidbits, 5 kinds of seasonal sashimi, grilled eel, flavored mini rice balls and miso soup. I love this bento, you get to taste everything. The sashimi here is one of the freshest around. The appetizers change seasonally, but rest assure that everything tastes yummy. There’s always a medium rare piece of duck or beef, and a little bit of stewed japanese veggie and root. I brought my mom last time, and she loved it. Maybe not the ideal serving for guys, but well… it is called “Jewel”, the ladies will enjoy, it’s around $20. 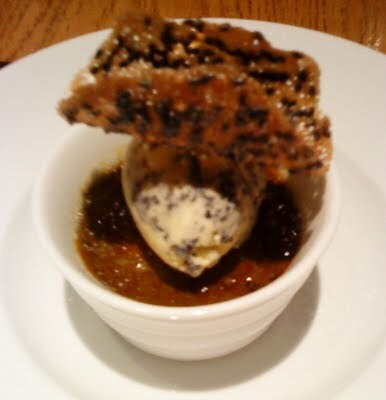 My all time favorite DESSERT is their Black Sesame Creme Brulee with black sesame ice cream. I love creme brulee, but this is 10 times better. It has all the great characteristics of creme brulee, but intensified by the fragrant black sesame. The flavors are so deep and rich, there’s no mistake here, no guessing, your having ground black sesame goodness in every bite. Usually after breaking the sugar of my brulee, I’m left wanting a little more crunch along the way, well… this one comes with a black sesame crunch to satisfy. This is a must go place when my friends are visiting from out of town and so far, I’ve had no complaints. The Chocolate Souffle is another good option, baked just right, infused with semi sweet dark chocolate, comes with a tiny cup of raspberry sauce on the side, giving it the right balance of sweet and tart. Pear Millefeuille with Earl Gray ice cream isn’t bad either, the pastry is very buttery and flaky and the ice cream is aromatic, just like the tea. Their signature truffles didn’t rock my boat, and were a bit on the pricy side. Seasonally, their creative pastry chef comes up with a “special” desserts. Last week, they had a Sake Panna Cotta with apricot sandwiches filled with mascarpone cheese. 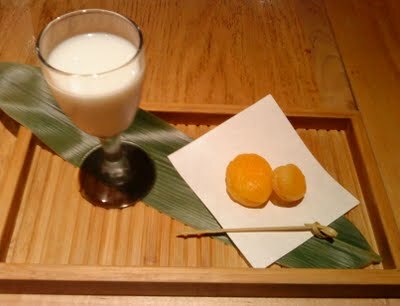 Velvety, creamy and soft with a splash of sake, the apricots were sweet and juicy, sooo good with the creamy cheese. This should be on their menu permanently! 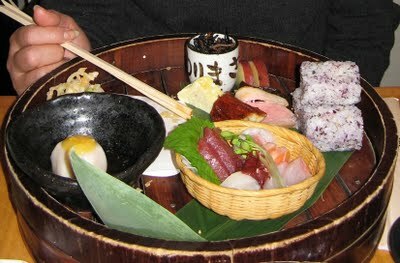 I love Sakagura for the fresh, intensely flavorful and authentic Japanese dishes! Great post! This is one of my all time favorite joints in the city. Great food and awesome sakes!